5) Exchange View Only Administrator. The delegation wizard in the EMC allows you to delegate the Recipient Administrator role for the entire Organization, but doesn’t allow more granular delegation at the Domain or OU level. 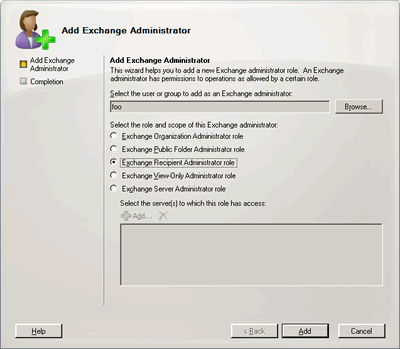 When delegating the Exchange Recipient Administrator role using the Exchange console or the Add-ExchangeAdministrator command in the Exchange shell, all you’re doing is adding the security principal (user/group) to Exchange Recipient Administrators, a (Universal) Security Group in the Microsoft Exchange Security container in AD. For more details about Exchange Server 2007 permissions, refer to “Configuring Permissions in Exchange Server 2007“. Here’s how you can delegate recipient administration for an OU. Exchange-Information and Exchange-Personal-Information are property sets – a number of related properties grouped together. Assigning permissions on a property set results in a single ACE in DACLS, making them much smaller and faster to process. Exchange Server 2003 adds Exchange attributes to the Public Information and Private Information property sets that exist in Active Directory. Exchange Server 2007 does not rely on these existing AD property sets, but creates 2 of its own. If deploying in an existing Exchange 2003 Forest, Exchange Server 2007 removes the Exchange properties added to the AD property sets and adds them to the new Exchange 2007 property sets. The Exchange-Information property set has 105 properties. Exchange-Personal-Information has 7. More information about the Exchange Server 2007 property sets and which properties are included in them can be found in “Property Sets in Exchange 2007“. Good article, thanks for that. One thing I am finding though is that recipient admins cannot create new mailboxes. The cannot view any of the stores when running through the wizard. Is this working by design and I need to add additional permissions? I was able to delegate user and contact creation on the OU, that will allow you to create a mailbox for a non-existant user, and allow you to create contacts. The problem I am having is on the delete side. When I delete a mailbox, the mailbox goes away and shows up in disconnected, also the AD user object is deleted too. Action ‘Disable’ was performed successfully on object ‘testuser3’, but there are some warning(s). Failed to commit the change on object “4166edc3-4017-4b60-a699-f6b6f7c6c718” because access is denied. I get the same error when I delete or disable the mailbox. I get exactly the same symptoms as above. My Exchange Recipient Administrators group did not properly apply permissions from the install. I re-applied them using the script above but get the same warning on disabling mailboxes. Good Article and Helped us a lot in Split Permission configuration for department admins. Department admins can create and delete accounts. But with the scripts , Manage Full Permission cannot be delegated. Thanks for this detailed article with step-by-step intructions – I was able to easily carry out the instructions. Its interesting how in Exchange 2007, they have defined roles that we can delegated using security groups. We came across a situation where we needed to know precisely who all can perform Exchange management, and that turned out to be a little hard to determine. Fortunately, we fou d step-by-step instructions on how to find out who is delegated what access and that helped us out a great deal. In case you are interested, the instructions can be found at http://www.activedirsec.com/how_to_assess_delegations.html. 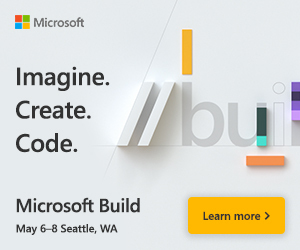 If you guys know of any automated way to find out how is delegated what access, please do share, as it could help save us a lot of time and effort. Next post: iPhone, meet Exchange: Will Apple make them talk?